Gables, dormers, and a covered L-shape porch adorn this charming three-bedroom country cottage with a detached garage option. The great room with fireplace is located up front to give the impression of a much larger home. The island kitchen, breakfast area, and dining room overlook the covered back porch and deck with spa. 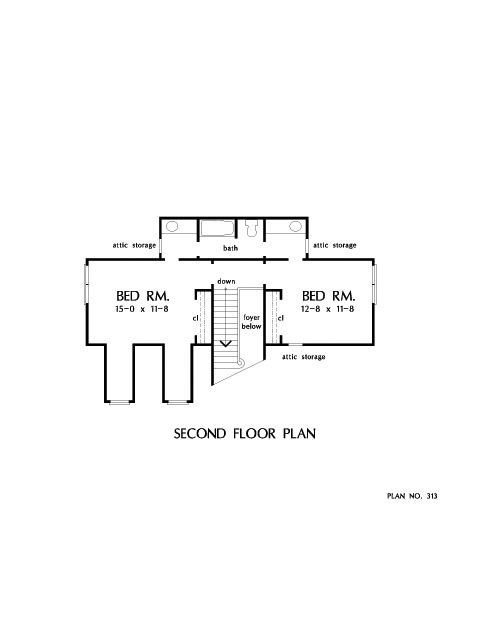 The master suite with built-in cabinets and large walk-in closet is located on the first level for privacy. The master bath pampers with a whirlpool tub, shower, and double bowl vanity. 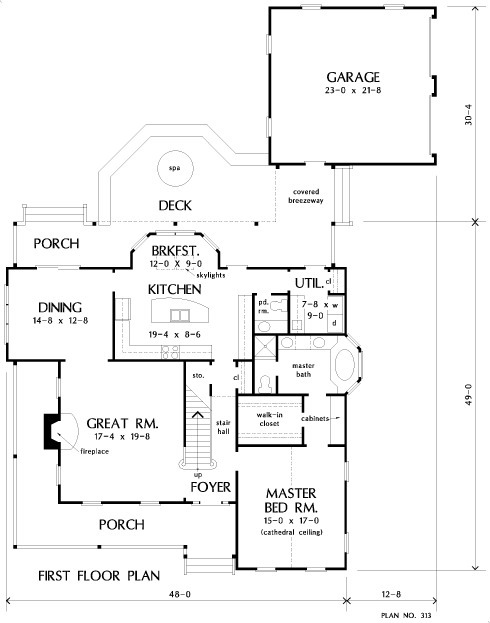 House Dimensions: 48' 0" x 49' 0"
Great Room: 17' 4" x 19' 8"
Garage : 23' 0" x 21' 8" x 0' 0"
Foyer : 7' 0" x 5' 0" x 8' 0"
Great Room : 17' 4" x 19' 8" x 8' 0"
Kitchen : 19' 4" x 8' 6" x 8' 0"
Breakfast Room : 12' 0" x 9' 0" x 8' 0"
Utility Room : 7' 8" x 9' 0" x 8' 0"
Master Bedroom (Cathedral): 15' 0" x 17' 0" x 16' 8"
Bedroom #2 : 15' 0" x 11' 8" x 8' 0"
Bedroom #3 : 12' 8" x 11' 8" x 8' 0"
Porch - Front : 31' 4" x 6' 4" x 0' 0"
Porch - Rear : 16' 7" x 6' 4" x 0' 0"
Porch - Left : 20' 0" x 6' 4" x 0' 0"
Deck / Patio : 24' 0" x 13' 8" x 0' 0"
Storage (Other) : 3' 4" x 11' 2" x 0' 0"
Porch - Other #1 : 16' 4" x 6' 4" x 0' 0"
Other : 2' 0" x 6' 10" x 8' 0"